Those three men were, of course, extraordinarily accomplished politicians. In this reference, however, Will manages to make two errors characteristic of his increasingly self-trivialized body of work. The first is one of method: he argues here for the virtues of a system based on three outcomes out of hundreds or more events. How shall we memorialize Pierce Butler, South Carolina’s Democrat-Republican solon in 1795-1796? How about Kentucky’s George Morton Bibb, who chaired the Committee on the Post Office and Post Roads in 1844-1845. And who can forget (remember-ed.) John Mcpherson Berrien, Georgia’s defender of states rights, who served and resigned from the Senate three times, notable mostly for his opposition to the Compromise of 1850 promulgated by two of the triumvirs Will celebrates and fought by the slavery-defender third, John Calhoun. Put this another cherry picking data is a forbidden practice in science, for obvious reasons: besides being fundamentally dishonest, it blinds you to what actually is happening in your observation. So it is with Will: a dishonest rigging of the data to support an assumption not in evidence — that the back room deals and paternalism of an indirect selection model for choosing senators produces incumbents superior to those chosen by the messy experience of direct democracy. The other flaw in Will’s argument is one of simple content. Are we supposed to hunger for a return to a system that produced the sequence of decisions, including the Compromise mentioned above, that led us to the brink of, and then over the abyss of civil war? I’m not sure what Will is really thinking here (if his rote recycling of half or un-baked ideas can be called thought–ed.). But whatever it was, I hardly think his case gets much help from the memory of three senators, who no matter how eloquent, failed to find a way out of a national crisis sufficient to avoid a conflict that killed one American in fifty. In other words: friends don’t let friends pay attention to George Will. Better to lob (verbal) tomatoes at this self-parody of a swell in a bow tie. 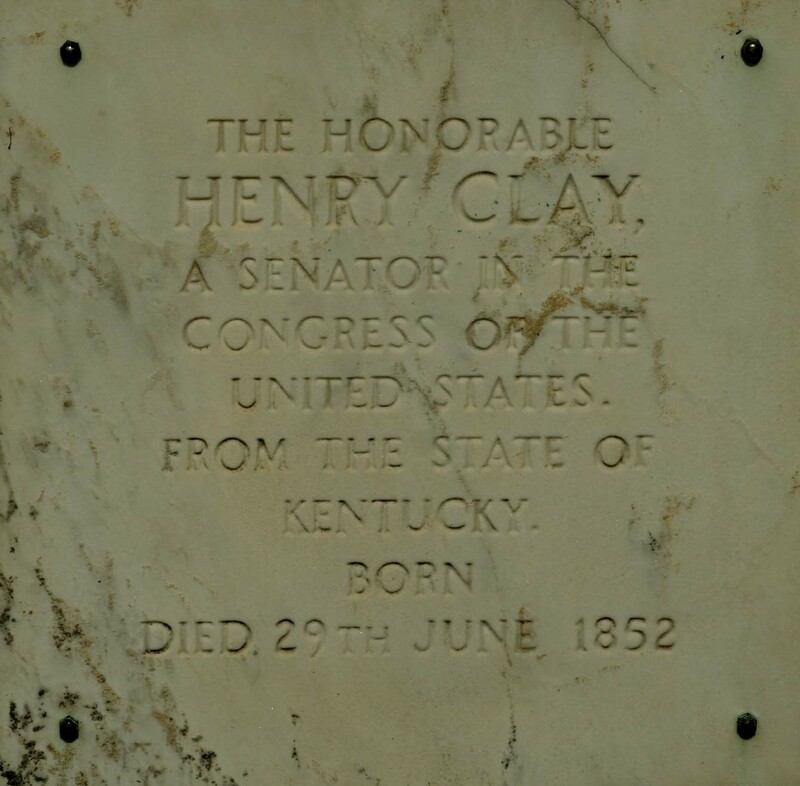 Image: Henry Clay’s Cenotaph in the Congressional Cemetary. This entry was posted on February 24, 2009 at 3:45 pm and is filed under bad writing, Journalism and its discontents, MSM nonsense, ridicule, Stupidity. You can subscribe via RSS 2.0 feed to this post's comments. You can comment below, or link to this permanent URL from your own site. To be fair, while that kind of cherry-picking is taboo in science, it’s the done thing when you’re a “pundit”. Or “commentator”. Or whatever he is. I don’t think Will is any wrose than a whole lot of other people on that front.